Decorating a home can be difficult. From the countess magazines, television programs and Pinterest, inspiration is everywhere. Still, these picture perfect layouts can almost become stifling. The beautiful homes seem almost unattainable. The normal family probably has piles of papers sitting on the counter and laundry by the bed. Still, one simple item can bring a little inspiration into any home. Personally, I love to hand pictures that I took on family vacations around our home. Granted, many of these photographs have family in the shot, a few pictures are just simple, nature stills. In this post, I have a shared a picture that I took on our family's vacation to South Africa. To the casual observer, this shot of flower is pretty, but to me it means much more. It captures a memory of a trip that was an once in a lifetime experience. Since I wanted this picture to be perfect, I wanted to make sure that the printed canvas was handled properly. Canvas Discount did an amazing job with my photograph. The colors are vibrant and the contrast in the images comes through on the canvas. There was no color bleeding or blurring. With so many pictures from my trip, I like to have many options to hang on my walls. 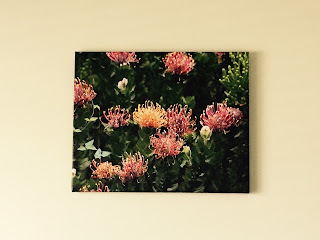 Canvas Discount allows me to print many of my personal photographs in various sizes. The quality product at reasonable prices means that I never have to stare at a blank wall. From large, like the one above, to groupings of smaller prints, I can relive every moment that as special meaning to me and my family. It's time to get those pictures off your computer and onto your walls. Canvas Discount can make it happen.